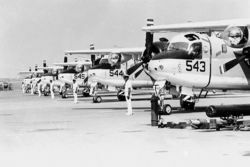 The Grumman S-2 Tracker (previously S2F) was the first purpose-built anti-submarine warfare (ASW) aircraft combining both detection and weaponry in a single airframe to enter service with the US Navy. Its predecessor, the AF-2 Guardian, used two aircraft for ASW, one with the detection gear, and the other with the weapons. This was very inefficient, and the Navy wanted a design that carried both. The replacement aircraft was to carry radar, a magnetic anomaly detector (MAD), ECM, acoustic equipment, and a searchlight, and be able to be armed with bombs, mines, torpedoes, and rockets. Grumman's design (model G-89) was for a large high-wing monoplane with twin Wright Cyclone radial engines. Both the two prototypes XS2F-1 and 15 production aircraft, S2F-1 were ordered at the same time, on 30 June 1950. First flight was 4 December 1952, and production aircraft entered service, with VS-26, in February 1954. Follow-on versions included the WF Tracer and TF Trader, which became the E-1 Tracer and C-1 Trader in the rationalization of 1962. The S-2 carried the nickname "Stoof" (S-two-F) throughout its military career. Grumman produced 1,185 Trackers. Another 99 aircraft carrying the CS2F designation were manufactured in Canada under license by de Havilland Canada. U.S.-built versions of the Tracker were sold to various nations, including Australia, Japan and Taiwan. 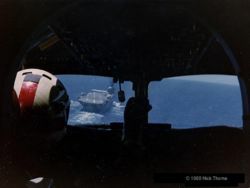 The Tracker was eventually superseded for US military use by the S-3 Viking - the last USN Tracker squadron was disestablished in 1976 - but a number live on as firefighting aircraft. Trackers continued to provide excellent service in Naval forces of other countries for years after the US discontinued them; for example the Royal Australian Navy continued to use Trackers as front line ASW assets until the mid 1980s. 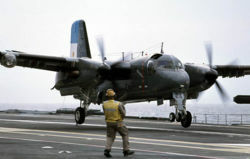 The Argentine Navy received its first S-2A models on the 1960s and later used the improved S-2E from the aircraft carrier ARA Veinticinco de Mayo. In the 1990s, they were upgraded with local software and by Israel with turbo prop engines nicknamed S-2T Turbo Trackers. With the retirement of its unique aircraft carrier, the Argentines currently use them from the NAeL São Paulo of the Brazilian Navy. In the late 1980s and early 90s Conair Aviation of Abbotsford, British Columbia, Canada took possession of retired US and Canadian Trackers and converted them into Firecats, with a retardant tank replacing the torpedo bay. The Firecats were made in two variants, a piston engined Firecat and a Turbo Firecat. S-2A - Anti-submarine warfare aircraft. This was the first production model. US-2A - Utility transport conversion. S-2B - Modified to carry AQA-3 Jezebel passive long-range acoustic search equipment. US-2B - Utility transport conversion. S-2C - Larger weapons bay, and larger tail. US-2C - Utility transport conversion. CS2F-1 - Initial production run of anti-submarine warfare aircraft for Canada. 42 produced. CS2F-2 - Improved version of CS2F-1 with Litton Industries tactical navigation equipment. 57 produced. CS2F-3 - New designation given to 43 CS2F-2 aircraft upgraded with additional electronics. CP-121 - New designation given to all CS2F-1, -2, and -3 aircraft following unification of Canadian military in 1968. S-2G - The final production version. Conair Firecat or Turbo Firecat - Single-seat firefighting aircraft. ARA antisubmarine naval squadron (Spanish: Escuadrilla Aeronaval Antisubmarina ) operated S-2A and S-2E since the 1960s. They were embarked on the ARA 25 de Mayo and used in the COD, Maritime Patrol and ASW roles. On August 26 1985, former president Raul Alfonsin landed on the aircraft carrier in one of these planes. In the 1990s, six remaining airframes where refurbished by Israel Aerospace Industries as S-2T Turbo Trackers and since 2001 they are annually deployed onboard Brazilian Navy NAeL Sao Paulo during joint exercises ARAEX and TEMPEREX. The Peruvian Navy operated with S-2E and S-2G from 1975 until 1989, they were assigned to Naval Aviation Squadron N°12 (Escuadron Aeronaval N°12). A total of 12 S-2E were bought from the United States Navy in 1975 and 4 S-2G in 1983. The RAN operated 2 Squadrons of S2E and S2G variants from 1967 until 1984. VS-816 front line squadron, although based at Nowra, frequently embarked the Majestic class aircraft carrier HMAS Melbourne, CVS-21, as part of the 21st Carrier Air Group whenever that ship was deployed. VC-851 training squadron was based at NAS Nowra, HMAS Albatross. During about twenty years of operation of the Tracker, the RAN lost only one S2 during aircraft operations due to an accident at sea. However, in the mid 1970s a deliberately lit fire in a hangar at Nowra destroyed or badly damaged a large proportion of the RAN's complement of Trackers. These were subsequently replaced with ex-USN aircraft. The replacement aircraft were all S2Gs, including the original aircraft modified by the USN to that status. This saw the introduction of AQA7 acoustic gear into RAN service and all RAN operational Trackers were subsequently modified to this standard. the AQA7 significantly enhanced the RAN's ASW capability. In the early 1950s, the Canadian military needed a new anti-submarine patrol aircraft to replace its outmoded TBM Avengers. In 1954, de Havilland Canada entered into a contract to build Trackers under license. A total of 99 aircraft would be produced for Royal Canadian Navy service. The first de Havilland CS2F Trackers began service in 1956. From 1957 onwards, these aircraft operated from the newly-deployed aircraft carrier HMCS Bonaventure (CVL-22) and various shore bases. In 1964, a pair of CS2F-1 aircraft were stripped of armament and ASW electronics, converted to transports, and subsequently used to fly personnel to and from aircraft carriers at sea. The CS2F-1, -2, and -3 were redesignated as the CP-121 Mk.1, Mk.2, and Mk.3 respectively following the unification of Canadian armed forces in 1968. After the Bonaventure was decommissioned in 1970, all remaining Canadian Trackers were transferred to shore bases. This limited their usefulness for ASW patrols, and in 1974, all but 20 were placed in storage. The remaining active-duty Trackers were transferred to fisheries protection and maritime patrol duties, where they would serve until 1990. A handful of Trackers were kept in flying condition until the late 1990s but were no longer used for active service. A single U.S.-built Grumman S2F-1, serial number X-500, was sold to the RCN before Canadian production commenced. It was initially used for quality control purposes during Canadian production, and was later given a new RCN serial number, upgraded to CS2F-1 standards, and used to train RCN ground and maintenance personnel. This aircraft was placed in storage in 1972 and was undergoing restoration in April 2006. In 1960, 17 CS2F-1 aircraft formerly used by the RCN were transferred to the Royal Netherlands Navy. The first three S2A Trackers owned by the Uruguayan Navy Aviation arrived on 10 April 1965 to the Capitan Curbelo Navy Base. On 15 September 1982 one S2G arrived. On 2 February 1983 another two S2G arrived. By September 2004 the remaining Uruguayan Trackers were not in flight condition. ↑ Tate, Colonel DH. Grumman CS2F / CP-121 Tracker. Canada Aviation Museum Aircraft. Retrieved on 2006-04-28. This page was last edited on 24 September 2009, at 00:28.